Charged with driving under the influence of drugs in New Jersey? We can help. New Jersey law prohibits the operation of a motor vehicle under the influence of intoxicating liquor or drugs. The phrase “under the influence” has been defined by our courts to mean a substantial deterioration of the mental faculties or physical capabilities of a person. Basically, this means a condition which so affects the judgment or control of the driver to make it unsafe for him or her to drive safely. Most DUI cases in New Jersey involve alcohol. But not all. Some cases involve impairment based on drug use. These cases are becoming more common due, in part, to the legalization or decriminalization of marijuana in many states and the worsening opioid epidemic. If you are charged with driving under the influence of drugs it is imperative that you have an experience New Jersey DUI attorney by your side. Unlike cases involving alcohol, claims of drug impairment require scientific evaluation of a driver. This is called a drug recognition evaluation. We refer to these as DRE cases. DRE cases involve, in a literal sense, guesswork by the arresting officer. 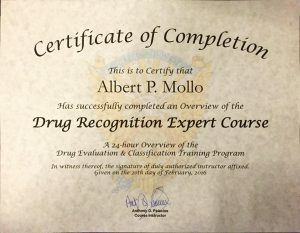 These officers, commonly referred to as Drug Recognition Experts, or “DRE” for short, receive extensive scientific training. Very few officers in New Jersey have this specialized training and, many times, they are unavailable at the time of arrest. As such, a DRE is often not performed. This provides an automatic basis for defense. In cases that do involve a DRE, the process is very specific and any deviation can result in a potential dismissal. After conducting an evaluation, the DRE must essentially make a guess as to the cause of the perceived impairment. Then, a blood or urine sample is requested, a necessary part of the DRE process. The DRE’s opinion is then compared to the test results of the blood or urine to determine if the DRE was correct. These cases are more difficult for the State to prove because, unlike alcohol, existence of drugs in a driver’s system does not necessarily mean that he or she is impaired. For example, if a driver ingests drugs yesterday those drugs will still be in his or her system tomorrow, yet the driver is no longer under the influence. So the existence of drugs in the system is not enough. The DRE must make specific and direct connections to the perceived reason for impairment. Was a DRE evaluation performed? Was a blood or urine sample obtained? If so, was there a warrant? Did the driver have a prescription? Does the DRE officer have a history of accurately guessing reasons for impairment? Are there other explanations for the perceived impairment? These are just some of the questions a trained New Jersey DRE DUI defense attorney will ask. Our law firm handles only DUI and criminal cases. 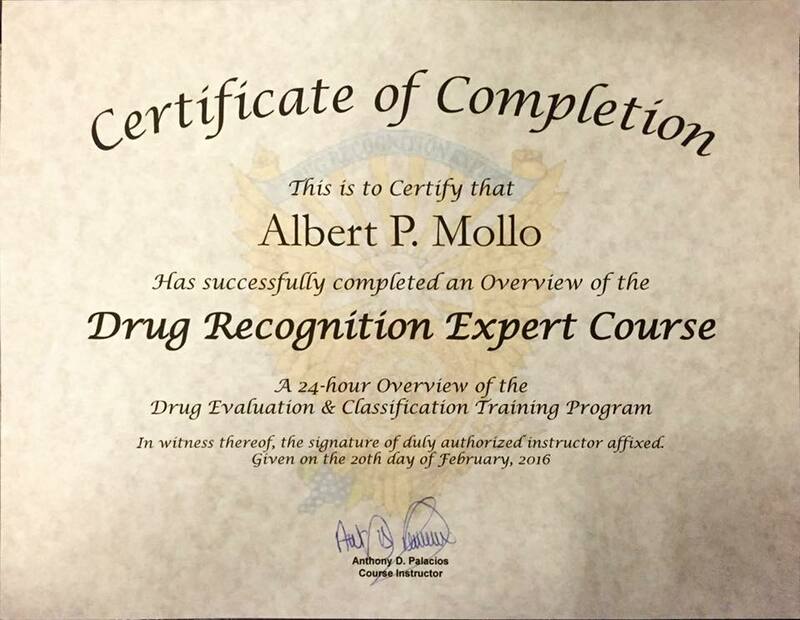 Al Mollo is one very few attorneys in the State to be certified in DRE training. He trained with one of the nation’s leading DRE experts in 2016 in Atlanta, GA. Since that time he has represented many people charged with driving under the influence of drugs in New Jersey. Please contact our office with any additional questions. Consultations are always free and always confidential.